These maps break down the EU’s wealth, region by region. Most people have a pretty clear idea of which countries in Europe are richer and which are poorer. Income levels thin out the farther south and east you go on the continent, you might assume, while Scandinavia and Germany enjoy the highest income levels. That roughly sketched picture is accurate enough, but what happens when you zoom in on the regions of each country? In a week where Britain’s government is finally making its plans to leave the European Union ever so slightly clearer, it’s a good time to look at exactly how wealthy each region in the EU’s 28 states really is—and to note the similarities Britain still shares with other North European members. 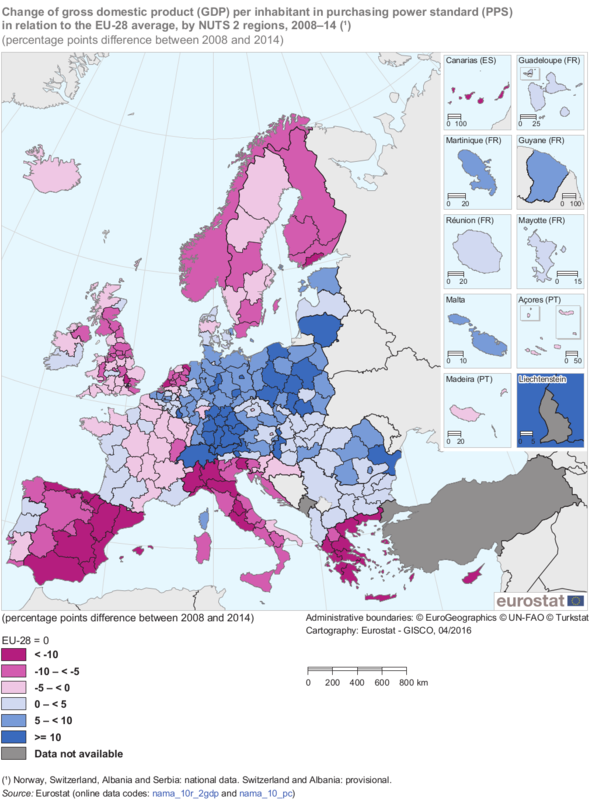 Overall, wealth is poorly distributed across the European Union, as made clear by March 2016 maps of regional GDP using the latest figures available from Eurostat. Meanwhile, the regions that have seen the largest decreases in per capita GDP aren’t necessarily the ones you’d expect. The map above, which is adjusted for each nation to show comparable purchasing power, demonstrates how much wealth varies from one region to the next. The former eastern bloc almost universally comes in below average, except for the regions around some of its largest cities: Bucharest, Budapest, Bratislava, Prague, and Warsaw. Iceland, Norway, and Switzerland, meanwhile, emerge as the only states where every region exceeds average wealth. The rest of the continent is an uneven mosaic, especially in the U.K. At the upper end of the scale, three areas are especially wealthy: London, the region around Oxford, and Northern Scotland’s Aberdeenshire (the landing point for the country’s offshore oil and gas extraction). Elsewhere, West Wales and County Durham have a per capita GDP so much lower that it places them in the same category as Southern Italy or Romania. Britain is not the only country with such high contrast on the wealth map. Even in wealthy Denmark, the southern part of the island of Zealand (home to many of greater Copenhagen’s poorer residents) shows itself to be markedly poorer than the rest of the country. The greatest contrast, however, is in Germany. Twenty-six years after reunification and the country’s wealth map is still split down the middle. Apart from small areas in Lower Saxony and the Saarland, western Germany is universally wealthier than the EU average. Step over the former border into eastern Germany, and GDP starts to plummet. The only areas surpassing average wealth are around Leipzig and in Berlin (only part of which, of course, was ever part of the German Democratic Republic). That contrast might seem stark, but residents of Eastern Germany can take comfort in the map below, which shows the changes in GDP per person between 2008 and 2014. Here you can see that wealth created per citizen has actually grown across the whole country. The only area where growth has been negative—and the few regions where growth has been modest—are all in Germany’s west. When it comes to decreases in relative wealth, the map confirms suspicions and throws up some surprises, too. The struggles of Southern European states ever since the 2008 financial crisis have been well documented, so it’s no surprise to find per capita GDP dropping sharply in Greece, Spain, and Italy. What might come as a surprise, however, are the poor showings in Britain, the Netherlands, and the Nordic countries. There have been warnings of declining salaries across Scandinavia for some years, but given the region’s reputation for excellent living standards, those warnings are often disregarded by outsiders. The Netherlands and, to a lesser extent, Britain often slip through commentary about falling living standards and growing inequality because such sharp decreases still place them above the standards of Europe’s south and east. These citizens, however, don’t take the news so lightly as they watch their living standards decline. The fall documented above could help to explain why, by their own high standards, these states are experiencing higher levels of political volatility and a gradual shattering of their postwar social democratic consensus. There’s another clear pattern emerging across the map: Europe’s wealth is heavily concentrated in major cities, usually capitals. In the Czech Republic, Ireland, Hungary, Poland, Portugal, Romania, and Slovakia, each nation’s capital region was the only one in its country to exceed the EU average in wealth. Paris and Bucharest also show up considerably richer than their national hinterlands, but the greatest contrast of all is in the U.K., where Inner West London, a small urban sub-region covering the British capital’s wealthiest districts, had the highest GDP of anywhere in the E.U. A few countries nonetheless bucked the trend. The Dutch city of Groningen proved to be wealthier than North Holland, the region containing Amsterdam, a blip possibly explained by North Holland containing unusually large tracts of rural and ex-urban land for a capital region. More striking are the differences in Germany and Italy. In keeping with Germany’s markedly decentralized wealth distribution and the relatively low income of its former eastern sector, Berlin is markedly less wealthy than Hamburg, while five regions in northern Italy’s wealthy industrial heartland exhibited higher per capita GDP than Rome. This atomization, and the migration it encourages, suggests that the severe housing shortages that now characterise Europe’s wealthier cities are highly unlikely to be resolved anytime soon.